We do not eat out a lot at restaurants so I love to recreate our favorite dishes at home to serve my family. Thai food is one of our favorites and Thai Kitchen is the best resource for authentic Thai ingredients for home cooking. I was very excited to try summer-inspired products from Thai Kitchen and Simply Asia. Thai Kitchen has a great selection of high quality packaged ingredients and ready to serve pre-cooked meals that are perfect for those busy nights when I don’t have time to cook from scratch. I feel confident that I am serving my family a nutritious and delicious meal without sacrificing quality or taste. I like to serve healthy meals to my family, so I appreciate that many of the products from Thai Kitchen have no artificial flavors or colors, are MSG free and there are even gluten-free options. This summer, I will be grilling out some of our family favorites giving it the new, bold and savory taste of Asian spices and seasonings with some great new products from Thai Kitchen and Simply Asia! The Thai Kitchen sauces and condiments are delicious and we recently tasted the newest offerings including Thai Kitchen Sweet Red Chili Dipping & All Purpose Sauce, Spicy Thai Chili Dipping & All Purpose Sauce for those like me who prefer a little extra heat and one of my favorite cooking ingredients for Thai Food, the Premium Fish Sauce. I love curry so I was excited to try a Red Curry Chicken and Vegetables dish using the Thai Kitchen Red Curry Paste as the base…….it was delicious. My husband claimed that he didn’t like curry but when he tasted this dish he said it was really good and ate an entire plate! I am really enjoying add a ton of flavor to many of our foods (even non-Thai dishes) using the Simply Asia Seasoning Blends. We love to grill shrimp, chicken and steak with the Sweet & Smoky Hibachi, vegetables are jazzed up with the Spicy Szechwan Five Spice Seasoning or Sweet Ginger Garlic and the Sweet & Spicy Saigon is delicious on roasted pork. 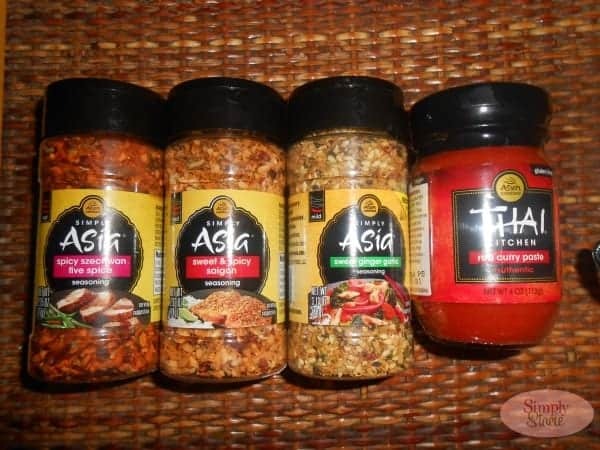 Thai Kitchen really kicked it up to the next level with seasonings, spice mixtures and sauces that pack a flavor punch and really make dinner time something special for the entire family. 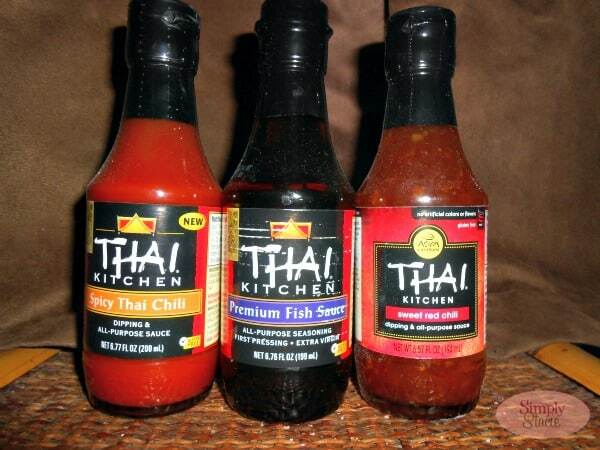 You can purchase Thai Kitchen and Simply Asia products online and at major grocers and retailers nationwide. To learn more about Thai Kitchen and Simply Asia you can visit their website and be sure to check out all of the delicious recipes too. I want to make Chicken Pad Thai. I would love to make the Coconut Chicken. It looks so yummy! I would love to make Green Curry Chicken with Basil for my family. Can’t wait to try all those! The green curry chicken sounds sooooo good! I would like to try the coconut chicken. It looks fabulous!! 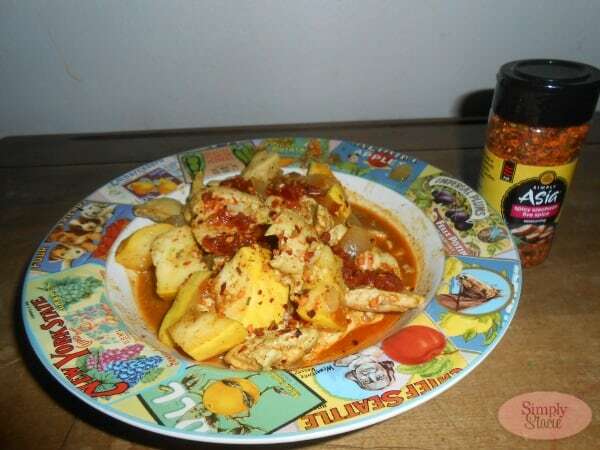 I’d like to make the Chicken Mango Satay recipe. I love their premade kung pao noodle bowl! YUM! SOOO good! I would most love to try the Thai Kitchen, Dipping Sauce, Spicy Thai Mango!! Cold Rice Noodle Salad with Spicy Lime Vinaigrette sounds amazing! I would like to make the Stuffed Crab Shells recipe.